← WOOSTER WATER SYSTEM – NEW WATER TANK! Ceremony, in honor of those that have served, will be held on Armed Forces Day this year which is Saturday, May 18, 2019. The program will begin at 10:00 am come rain or shine! There will be a free lunch for those who attend. There will be two (2) raffle drawings for two (2) beautiful handmade Patriotic Quilts for all veterans in attendance. The two (2) veteran winners will be prestigiously honored with the beautiful handmade Patriotic Quilts made exclusively by the RoadRunners Extension Homemakers Club. Judge Jim Baker and Justice of the Peace Jerry Boyer will both be in attendance. A Color Guard Ceremony will take place and the Arkansas Army National Guard Youth Challenge will be participating as well…a must see! 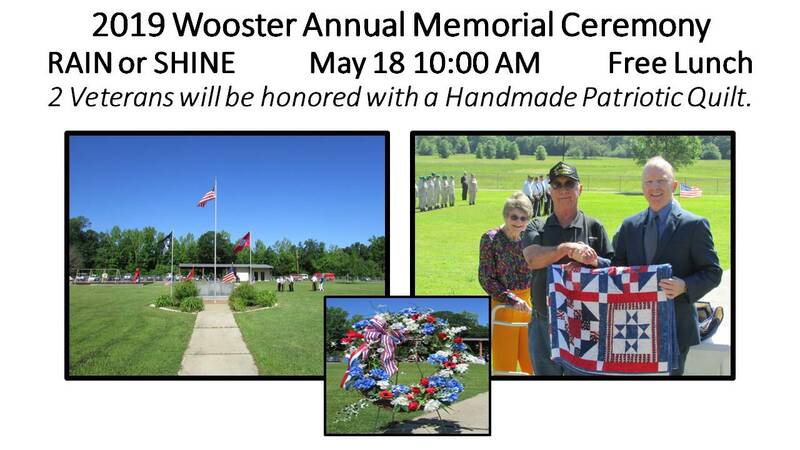 Please notice in the above Wooster Memorial Ceremony Poster of the Past where Faulkner County Administrator, Tom Anderson is shaking hands with Eugene Duderstadt LTC, a veteran of the United States Army, serving two (2) tours in Vietnam, 9 months as an Infantry Platoon Leader, and two (2) tours in Germany, totalling 7 years in Germany for winning that year’s raffle, with the Color Guard and the Arkansas Army National Guard Youth Challenge in the background…then there is Mrs. Marie Wilson, who recently passed on March 13, 2019, bless her heart. It is at this time we would like to lift her up in honor for she was a resident of Wooster for over 50 years. She served the City of Wooster as City Clerk and Water Supervisor for 35 years! Not only was she a charter member of the Greenbrier Civitan Club, she was the founder and a long term officer of the RoadRunners Extension Homemakers Club. She was a lifelong member of Wooster First Baptist Church, serving in several roles. Marie was awarded Arkansas Floodplain Management Association Manager of the Year in 2005 and Modern Woodman of America Hometown Hero Award in 2014. 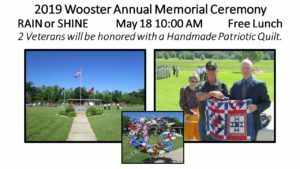 She worked with every mayor for the City of Wooster, the former & late Mayor John Ragan Patton 1960-1974, former Mayor Johnnie D Stone 1975-1998, former Mayor E.F. (Sug) McMillen 1999-2007, and our presiding Mayor Terry D. Robinson 2008 to present. 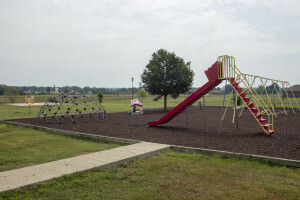 Her “baby” for the City of Wooster was Wooster City Park, where she designed how the park would look itself. She made her own blueprint. Marie is the one who started the Annual Wooster Memorial Ceremony as well as our famous Independence Day Celebration with the fabulous fireworks! She was all about honor and lifting others up, so this year and at this time, we lift Mrs. Marie up to the highest! Thank you, Marie Wilson for all your hard work, your diligence and support in every way, in making the City of Wooster grow and become a better place to live! We would also like to extend a huge thank you to Mr Billy Wilson, Marie’s devouted husband who was always there to support her in every way through every day! Thank you! A special invitation is extended to all elected officials. The City of Wooster would like to thank our sponsor, The RoadRunners Extension Homemakers Club for all their hard work in providing the lunches, raffles, and the festivities.